Some of you might be familiar with Andre Polk. Most of you probably aren’t. He wasn’t a big time writer; I don’t think he had anything published. But if he loved writing, and if you happened to be a member of the Space Opera: Writers group over on Facebook prior to his death, you knew what kind of guy he was. Though chronically ill and constantly in and out of the hospital, he was consistently cheerful and would religiously post a fun “Question of the Day” to prompt discussions in the group. He lost the battle against his illnesses earlier this year, and his absence in the group is still felt. You folks being a science fiction sort of audience, I feel like I can make the comparison to the Enterprise after Spock’s death without anyone feeling like I’m trivializing the loss of a friend. 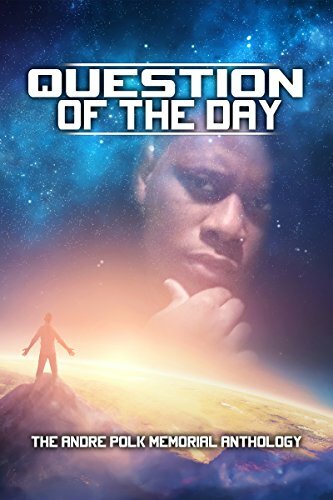 Question of the Day: The Andre Polk Memorial Anthology is the Space Opera: Writers response to Andre’s death. Twenty-two space opera stories gathered together as both a memorial and a gift to Andre’s family; proceeds will got to his family. Help us remember a lost friend and care for those he left behind by picking up a copy. Question of the Day will be available on Sept 18th; it’s available for pre-order now.